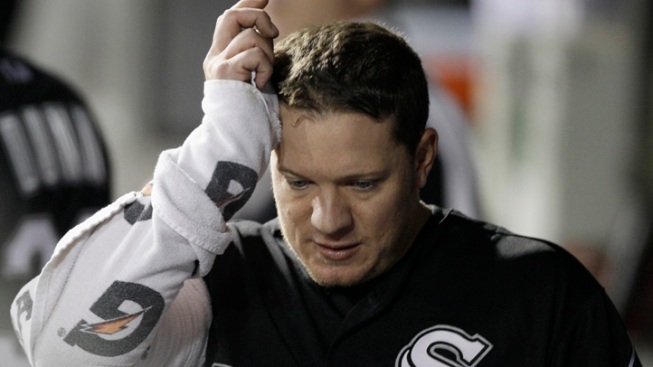 Chicago White Sox starter Jake Peavy wipes his face in the dugout during the second inning. Evan Longoria hit a tiebreaking homer in the ninth inning and the surging Tampa Bay Rays won their eighth straight game Thursday night, handing the White Sox a 3-2 loss that hurts Chicago's playoff hopes. The Rays remained two games back in the race for the second AL wild card, while the White Sox fell two games behind Detroit in the AL Central after their eighth loss in nine games. Tampa Bay and Chicago have six games to go, including three more against each other. Detroit beat Kansas City 5-4 earlier Thursday. Longoria's 14th homer came on the eve of the anniversary of his dramatic shot that beat the Yankees on the final day last season and gave the Rays the AL wild card. Joel Peralta (2-6) pitched an inning for the win and Fernando Rodney finished for his club-record 46th save in 48 chances. After giving up a two-out single to Kevin Youkilis, Rodney struck out Adam Dunn on a 3-2 pitch to end the game. Brett Myers (3-4) gave up Longoria 's homer while pitching 1 2-3 innings. The right-hander has allowed a run in each of his last two outings after a run of six consecutive scoreless appearances. The sliding White Sox wasted a handful of opportunities to grab control of the game, continuing their recent struggles to hit with runners on base. A.J. Pierzynski led off the eighth with a single. Pinch-hitter Dewayne Wise then struck out after failing out to get down a bunt and pinch-runner Jordan Danks was ruled out on a double play on Alexei Ramirez's fly ball when he apparently failed to retouch second base on his way back to first. Chicago left 10 on base. The White Sox loaded the bases with no outs in both the fourth and fifth innings and scored just two runs. Paul Konerko hit into a double play with the bases loaded in the fifth, tying it at 2. Luke Scott started the fifth with a drive off Jake Peavy for his 14th homer, giving Tampa Bay a 2-1 lead. Ben Zobrist doubled to open the fourth, moved up on a fly ball and scored on Carlos Pena's sacrifice fly to give the Rays a 1-0 lead. Chicago tied it in the bottom half when James Shields walked two and gave up a single to Alex Rios to load the bases with no outs. One out later, Shields hit Dayan Viciedo with a pitch to force in a run, but he retired the next two batters to avert the big inning. Shields gave up six hits in 6 1-3 innings, throwing 117 pitches. He struck out six and walked four. Peavy went 7 1-3 innings, leaving after walking pinch-hitter Sam Fuld. He gave up four hits, struck out six and walked one. Tampa Bay had runners at the corners with two outs in the second when Peavy made a fake throw to first and was called for a balk by first base umpire Chad Fairchild. Jeff Keppinger was waved in from third before the umpires conferred and wiped out the balk call, sending the runners back to their bases. Rays manager Joe Maddon came out of the dugout for an explanation from home plate umpire Brian O'Nora before Peavy struck out Matt Joyce to end the inning.